The Plans Update Strike page has some more detailed photos of the boat and trailer. The Strike is available as both an open deck boat, as we have built, and also as one with a removable cuddy for a basic one/two person micro cruiser. One reason why I build prototypes is to refine the design. Even before launching our Strike I decided to raise the wing bottoms slightly and to lower the front windscreen. Even with the raised wing and lowered windscreen there will still be plenty of room below with the cuddy fitted. On the prototype the outriggers are cut down 18ft singlehander hulls. The mast is a shortened Tornado mast while the mainsail was originally a cut down 18sqm but was changed in 2010 to one from a Trac 16. The jib is also from a Tornado, but 38 years old. So, as you can see, with a bit of time spent modifying things, you can use parts from most beach cats. My third ever sail on the Strike was singlehanded on a breezy day. In fact the first time in 2009 that we saw white horses in our normal sailing area. The wind was certainly well over 20 knots at times. The local multihull association (the BCMS) was having a regatta so I decided to sail along with the fleet for a while. An indication of the wind strength was that I was the only boat unreefed (because the original mainsail had no reefs), a Farrier 32 was double reefed. Unfortunately, after the first sequence I was rather along way from shore, but you should be able to see that I did sail at a steady 10 knots for much of the time (11.2 was the highest speed on the gps). In the last shot I appear from the right. The other boats on the video are a F24, a F32, a Banks 35, a Horstman 38 and Bad Kitty, one of the fastest 35ft cats in the world. Instead it is for those who may be new to boatbuilding and multihulls and want to start with a quick and easy project. And it is also for those who already have a beach cat and enjoy it, but who also want to be able to take the whole family out on gentle sails. Although the windscreen and "big box" cockpit might look ungainly they are very practical features, especially for those who don't enjoy getting wet and just want to be taken out for a fun sail. The deep cockpit and big wings make the Strike cockpit very dry. Any bow-wave spray, or oncoming waves, are forced under the wing, not into the cockpit. 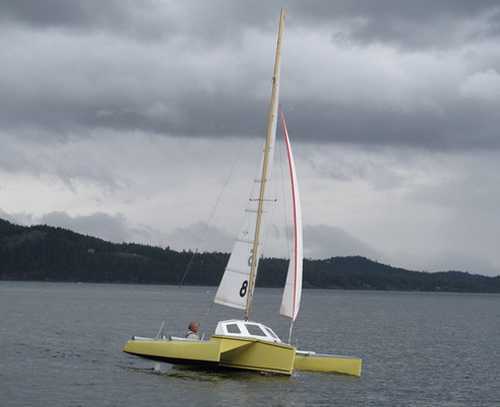 Check out youtube videos from similar open trimarans that don't have these wings, and you'll see how wet they are in comparison. In four years of sailing, usually twice a week, we have only very occassionally had light spray into the cockpit, never a solid wave. It is a "sit in" boat, rather than a "sit on" boat, which is more comfortable and a lot more reassuring for nervous crews and for those with young children. As the photos and videos show it is extremely relaxing to sit back and steer (cockpit cushions were an early "must get" item on the shopping list - along with drink holders). The cockpit is a very sociable area and easily sits four adults, it is possible to squeeze in six. In comparison a "sit on" boat is tiring after only a few minutes. NOTE: the video below, and the one sailing with the big trimaran above, were taken before we fitted the trampolines and other details. See the Latest News page for newer videos showing the fully completed boat. For trailering the outrigger hulls fold up. 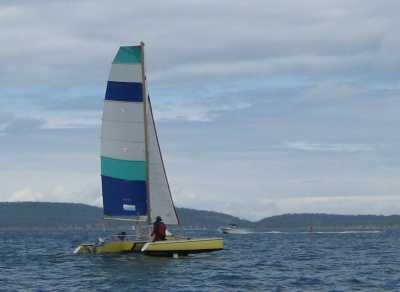 Because they are beach cat hulls they are very light (around 30kgs, under 80lbs) and so it is easy to do, even singlehanded. The centre of gravity is still relatively low so no problems when driving. Trailering beam is under 8ft. The flat hull bottom makes it very easy to launch and retrieve, while no trailer chocks are needed. Initially we used a flat bed trailer, but now have a off the shelf 1000lb (400kgs) boat trailer. 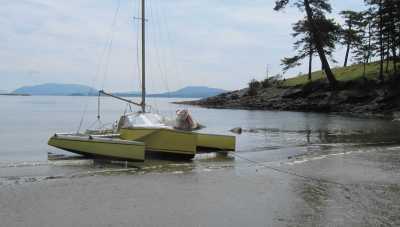 Because of the flat bottom a strop fore and aft is sufficient to hold the hull securely on the trailer. I have found that much of the time spent assembling a trailable boat is un-tieing all the bits. So the fewer strops the better. As always, practice makes perfect and we can now launch and retrieve the boat in under 15 minutes. I timed one such retrieval. We sailed up onto the beach (no motor) at 4.36pm and drove away with the boat lashed down on the trailer at 4.49pm. Thirteen minutes! And that was basically singlehanded, as Jetti was taking video (see Latest News page) I'm sure we will get a bit quicker. Plans for the main hull are GBP100, or GBP150 including the Quattro 16 plans if you want to build the complete boat yourself. Plans are available only as download plans in pdf format. Please Note: The Strike is only on the Order Form right now, it is not on the Shopping Cart. That is because I process the Order Form orders manually and thus have more contact with builders, which I think is important in the early days of a design. So to order please use the Order Form, and please say in the Comments box whether you also want the Quattro 16 plans or just the Strike main hull plans. I will process your card and then email you the drawings directly (there are no paper plans). Don't worry, the Order Form is on a secure server, as is the Shopping Cart. 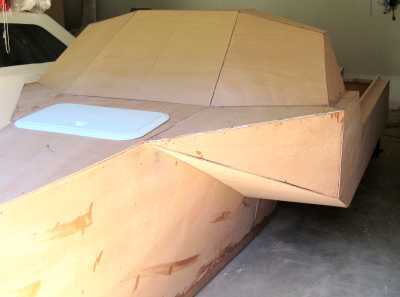 The photo below shows the prototype after 75 hours work. It took about 150 hours to finish the main hull prior to final painting.